I was at a birthday dinner last night for my 96 year old mother and was sitting across from my aunt. My aunt used to dive (in fact I certified her and my uncle many moons ago). Her husband, my uncle - mom’s brother, passed away a few years ago. Anyway, she asked me what I was up to these days and I told her about the Sea Hunt Forever event in Silver Springs. She then related the following story. By way of background, my uncle hand-built a 60 foot powered catamaran back in the 80's. I watched him build it from the keels down (he built the hulls upside down). See photo below. 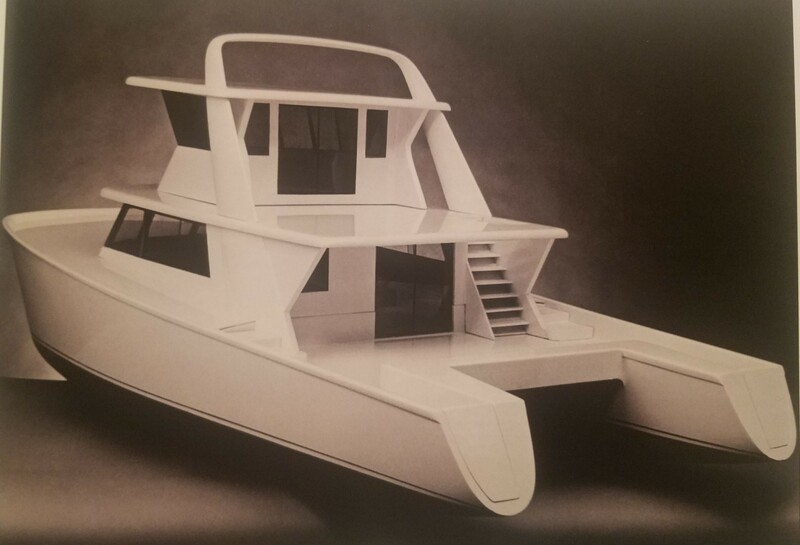 It was a very unique boat and was prominently featured in several yachting magazines at the time. My aunt and uncle were on board on a trip up through the Canadian Gulf Islands in British Columbia in the early 90's. They were anchored in a little out-of-the way cove getting ready for lunch and doing some fishing. All of the sudden a small sea plane buzzed them, landed, and taxied over to their boat. Out steps Lloyd Bridges, tells my aunt and uncle he saw their boat from the air, recognized it, and asks if he can have a tour. Now my uncle was used to being around famous people, my aunt not so much. She said she was so star-struck she had a hard time articulating a proper sentence. Anyway, they invited Lloyd and his pilot to stay for lunch, do some fishing, etc... He did! They had a great afternoon together. Then Lloyd got back in his sea plane and flew off to some resort he was headed to. One of those stories no one would ever hear about otherwise. Really interesting boat and story. Way cool! Very interesting boat. And very cool story. All I can say is pretty much everyone else's thoughts. Wow, what a fine looking boat, and a great story to go along with it. Tell us more about the boat! That was a great story. it makes you wonder of all the other stories people have that no one hears about that are lost when those involved pass on. I remember one time my father brought home the old actor Pat O'Brien home to meet my mother. That was a big thrill for her as he was a well-known star from her generation. I was not that impressed as I did not really know who he was but it was a big deal for my mother. Your story jogged my memory about that and I had about forgotten it. But I would have really been thrilled if my dad had brought home Lloyd Bridges instead of Pat O'Brien. Building the boat took my uncle 4 years. He paid an Australian marine architect a lot of $ to draw up the original plans. By the time he was done modeling and testing those models he had pretty much redrawn those original plans so they became unrecognizable. One of the original models. 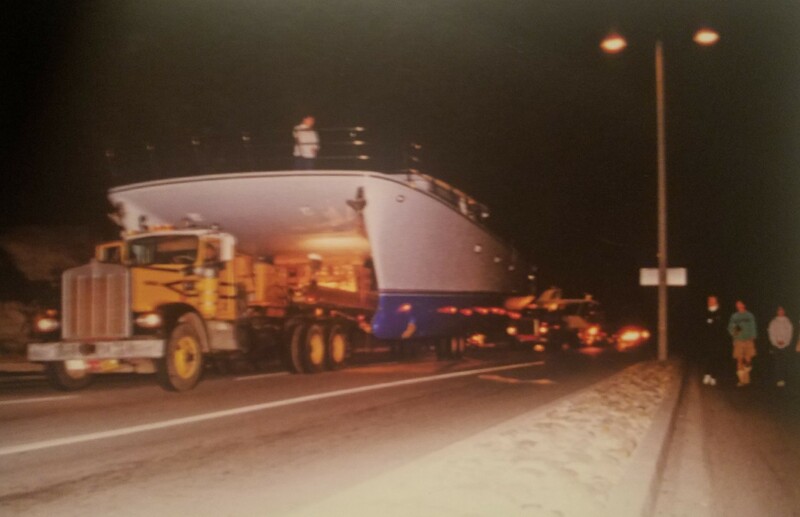 Taking the boat from the warehouse where it was built, down the street to launch for the first time at 3 a.m.
P.S. The boat is now for sale so anyone interested speak up See link below for all the specs. Way Cool Boat! And a wonderful story. Your uncle was Hobie Alter. Yeah, I was thinking your uncle wasn't just your average back yard boat builder, then I read your link to boat specs and saw his name. You have an interesting family. P.S. Wife #3 or #4 was Miss Hawaii and we had one hell of a wedding party at Iolani Palace on Oahu and a bachelor party to end all bachelor parties at the Outrigger Canoe Club. Seems like being a "cool surfer dude" may have been a lot more fun than being a landlocked dive shop owner. I wonder if it's too late to take surfing lessons? Better view of topsides that I took on a 2007 trip to Puget Sound, WA. 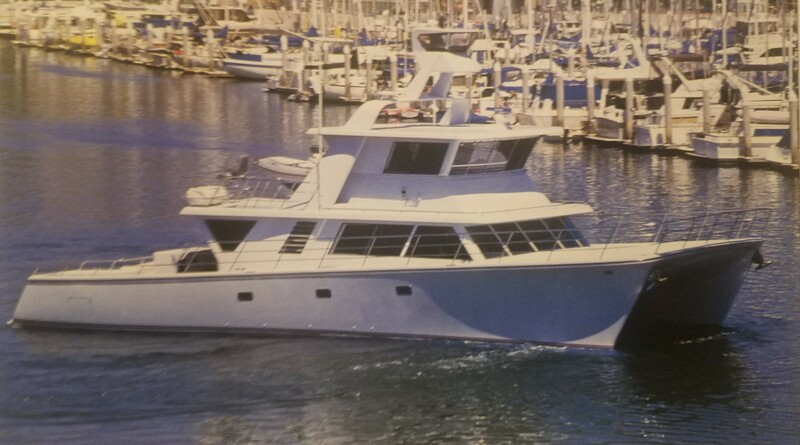 The boat on the right is a 53 foot Prima twin diesel that I had chartered as a bareboat for that trip (right after receiving my Captain's 6-Pack license). It was just me, my wife and son (age 3 at the time). That was a blast diving out-of-the way spots. That's Hobie on his dock on Orcas Island. Yours truly skippering through the San Juans and Canadian Gulf Islands.